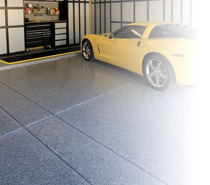 Slide-Lok's Acrylic floor coating is an excellent alternative to our polyaspartic and epoxy coatings. We highly recommend our Acrylic floor coating to homeowners who want a GREAT looking floor at a fraction of the cost. Our acrylic chemistry features excellent adhesion that this coating can be installed without the necessary floor prep required for polyaspartic or epoxy. With minimal floor preparation, diamond grinding or acid washing is not needed, the savings are passed on to you! Other characteristics include fast drying between coats, extremely long pot life, and is incredibly user friendly that you could Do-It-Yourself. For more information regarding our Acrylic floor coatings please contact us.